Second tier side Sekondi Hasaacas club friendly with Accra Hearts of Oak on Sunday at the Sekondi Gyandu park recorded GHS 5,295 as gross amount. The DOooo boys, Hasmal lost 4:0 to the highflying Premiership side Accra Hearts of Oak at the backyard of Hasmal. 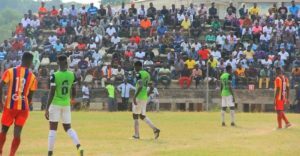 Even though Sekondi Gyendu Park was almost-filled to capacity during the cagey encounter, Hasaacas recorded a shocking GHC 5,295 as gross from the gate proceeds. For the first time in the history of Sekondi Hasaacas, GHC 10 and GHC 20 were charged as gate fees but astonishingly the home side recorded only GHC 5,295 in gross from the almost-filled Sekondi Gyendu Park.